It all started with one of those Scholastic Book Club flyers, being passed around my elementary school. As I scanned the pages my eyes fell to one particular book and I found I couldn't look away. 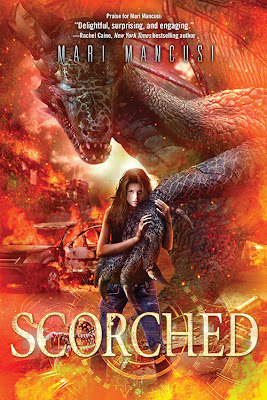 The cover depicted a mighty dragon, filling up almost the entire page—claws outstretched, teeth bared, fire blasting from its throat. At the bottom, there stood a girl, wielding a mighty sword, determined and unafraid as she took on a creature ten times her size. The book was Robin McKinley’s Hero and the Crown. And the cover is still one of my favorites—even today. (As is the book itself!) In fact, I reread the paperback so many times it eventually fell apart. But my love for dragons has lasted forever. Now I have my own dragon book. Set in our world—in our time—with one last dragon egg, unearthed from a melting glacier and ready to hatch. But will this dragon have the power to save our world? Or will its very existence serve to tear us apart? Love the fiery red cover! Action, romance....FIREBALLS! ;) Be sure to grab this one!